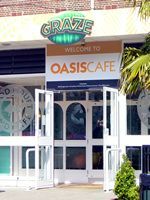 Sound Division recently completed a multi-zone audio installation at London Zoo's newest eatery, Graze. Graze is the result of a complete refurbishment of existing facilities which has given rise the addition of a further 90 seats, a wider choice of food styles available across different counters and a more comfortable, yet contemporary eating environment which includes a brand new sound system. The brief was to provide a high quality yet discreet audio system that could be zoned across the four main areas of the food court and coffee bar. To that end, Sound Division's David Graham specified a total of twenty JBL Control 26C 120W ceiling speakers throughout powered by two Inter M QD4960 with control courtesy of a Cloud Z4 mk11 4-Zone mixer. A Pioneer 6-disc multiplayer has been provided for music playback purposes. As far as zone control and selection is concerned, two Cloud RSL 6 remote music source and control panels have been installed into the coffee bar and the Raffles bar, while the main foodcourt and staff catering/function facilities both sport the more sophisticated Cloud LM1 remote control panels with line and mic inputs and source selection. This will enable entertainers, magicians, clowns, after-dinner speakers etc. to plug into the main house system and broadcast into any or all of the zoned areas as required. According to David Graham the installation has been a success. "The client required a high quality system for background music and speech reinforcement that was intelligible throughout, physically discreet, and yet versatile enough to handle four separate zones with the potential of different source selection. We were able to achieve everything that was required both to time and to budget, so everybody is happy."